Do you have a financial advisor or thinking of hiring one? You MUST ask these 10 questions. 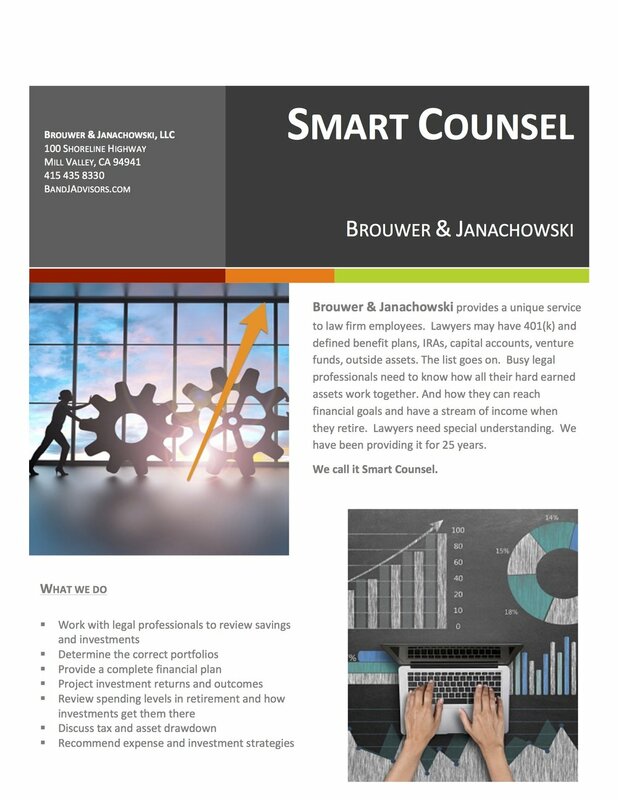 We have worked with attorneys and their financial needs for many years. Attorneys have a unique career trajectory. Typically, this means peak earnings come later than other professions but can also last longer. It's also a profession which never lets up. Hours are long and challenging. So creating financial independence as soon as they can. See the attached for a quick review of what we do. A fiduciary must put the client’s interest first. And is legally liable if they fail to do so. So they can't act for their firm, their personal income nor for any product they may represent. An advisor as fiduciary cannot have any conflict of interest and must state all fees clearly and in advance. It is a binding legal relationship. If you get no further on this page, ask this first! A fiduciary has a higher degree of accountability than “suitability.” For example, it may be “suitable” for a client to invest in high-commission, high-cost mutual funds simply because it meets a client’s growth objective. But a fiduciary must take the next step and show that a fund is as low cost as possible, with no hidden fees and disclose what, if any, fees or rewards they may receive from any third party. The answer you should look for: "Yes, I am a fiduciary under the requirements of the Department of Labor Fiduciary Rule (more here)"
2. What investments do you use and do you recommend proprietary products? Some advisors use only non-affiliated investments, some use their own in-house funds and some do both. There’s nothing inherently wrong with any of them. Vanguard, a very reputable firm, may only recommend Vanguard funds on the basis that they have many funds and they're among the cheapest in the business. However, there are plenty of times when the in-house funds are neither the best nor the cheapest option. Either way, you need to know if your advisor can use any fund to meet your needs. And that the investments are tailored for you. The answer you should look for: "Yes, we can provide funds from multiple investment firms." 3. How are you compensated? An advisor may receive fees from you, the client, and commissions from selling you a mutual fund, annuity or insurance product. They may also participate in sales competitions or other awards. A fiduciary advisor receives only the management fees paid by the client. And these fees are agreed on and disclosed up-front. They should be in the range of 0.5% to 1.2% depending on the assets. The answer you should look for: "Yes, we only receive management advisory fees from you the client. We receive no other incentives, commissions, cash or non-cash compensation, soft dollars or inducements." 4. How much turnover in my portfolio should I expect? The third is a function of the trading costs (see #5) times the number of trades. Generally, the higher the turnover, the higher your expenses. Any number above 50% should ring alarm bells. The answer you should look for: "On average, our turnover is between 5% and 15%. It can depend on market conditions but we aim to keep turnover low." 5. What are my fees, trading costs and any other expenses? Investment expenses can be one of your highest household bills. You will want to know what you pay in management fees, trading and any other account maintenance expenses. You should know what these will be every year, although some, like trading costs, will depend on the amount of turnover in your portfolio. If you're paying more than 1% in management fees, well, you shouldn't be. The answer you should look for: "We charge x%, depending on the size of your account, and around $5.00 for ETFs and $20 for mutual funds. And that’s per trade not per share." 6. What are the average total expense ratios of the funds you might recommend? In today’s world of lower expenses, you should not pay high expenses for your investments. If it’s a mutual fund, you should be invested in Class I or “A shares at NAV”. Not Class B or Class C. Expect to pay less for an index fund. A reasonable average would be 0.5% for equity funds and ETFs and 0.4% for fixed income funds. If they’re index funds, cut another 0.2% to 0.3% from those numbers. There’s plenty of information on the importance of low cost funds. The answer you should look for: "We offer low cost, no commission index funds and ETFs. The weighted average expenses of our portfolios do not exceed 0.6% (and lower is better)." 7. Who custodies my assets? A custodian (usually a bank) holds title to your assets. It will ensure your assets are not commingled with other clients (which was one of the problems at Madoff). You want to make sure that a reputable U.S. domiciled custodian holds your assets. You should also have a choice of custodians, for example, Schwab, Vanguard, Fidelity, TD America, NATC. The answer should you look for: "Your assets are custodied at [this should be a company you know] and independent of our [the advisor’s] operations. It is your account, not ours. You can instruct the custodian to change or fire your advisor at any time." 8. How are investment decisions made? You will want to understand how investment decisions are made and how they take your personal circumstances into account. Some investment processes are quantitative, some value based. Some are committee based and modular. Others are more fluid. But everyone should have a thorough systematic method that you understand. Your advisor should be part of the decisions and must take into account your needs, taxes, objectives and risk tolerance. The answer you should look for: There are many choices. Just make sure you understand them and listen for the phrase “…depending on your needs and goals”. 9. Are my investments in public, tradable securities? Most advisors use public stocks, mutual funds, ETFs and bonds. These are all traded daily on national exchanges and platforms. Some advisors offer non-public investments. These may include venture, real estate, private equity and hedge funds. These will be i) expensive and ii) illiquid. You need to know if your assets will be invested in non-public funds. The answer you should look for: "We use public securities. If we propose any non-public funds or pooled investments, we will explain all costs and liquidity limits clearly before we invest on your behalf." 10. How much experience do you have, who will look after my account and what succession plans do you have? OK, we know these are three separate questions. But they’re all to do with the personal side. Look for a minimum of 10 years investment experience. You don't want an advisor learning the job on your time. Check for designations like Certified Public Accountant (CPA), CERTIFIED FINANCIAL PLANNER™ (CFP®) (1), Chartered Financial Analyst® (CFA) or Juris Doctor (JD). Find out who actually manages your account. It’s common for firms to have one person “pitch” the account and another manage it. And ask for references. Finally, the advisor should have a detailed succession plan in case something unexpected happens. Your high level of service should not change and the same group of experts should continue to provide your wealth management and financial planning needs. Check the experience and background of your advisor on the FINRA website or the firm on the SEC website. If they're not on these sites, leave immediately. The answer you should look for: Your primary advisor and team has 10 years of investment experience through all market cycles. Your management team includes [get introductions to at least three people] and the firm’s succession plan ensures full continuity. Selecting a financial advisor is a very important step. If they do their job right, you will be working with them for many years. Take your time. Make comparisons. And use these questions. 1. the Certified Financial Planner people insist on caps! We’re not suggesting a bubble… but maybe now is a good time to talk to an advisor?